It is expected that geometrically chiral plasmonic nanostructures can enhance the intrinsic optical chirality of circularly polarized light. 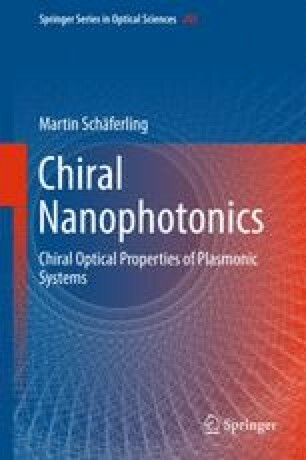 Therefore, we analyze the chiral near-field response of different chiral nanostructures illuminated with circularly polarized light in this chapter. We show that properly designed planar geometrically chiral nanostructures can result in a natural spatial separation of chiral near-fields with opposite handedness. Three-dimensional geometrically chiral nanostructures, on the other hand, interact strongest with one preferred handedness of the incident light and can lead to chiral hot-spots, where particularly high optical chirality occurs. Based on these findings, we provide basic design principles for chiral plasmonic near-field sources based on geometrically chiral nanostructures.